Video takes an honest look at the relationship between families and continuing care providers of people living with dementia | Alzheimer Society of B.C. Both SafeCare BC and the Alzheimer Society of B.C. believe that the most successful care teams are just that – teams of people who develop strong relationships based on clear communication and mutual respect. Ultimately, they’re all working towards the same goal: to provide the best care possible for the person living with dementia. “One day I walked into my wife’s room and the care aide was dancing with [her], because this care aide had read the [care] manual, she knew that she taught dance. It was beautiful. I almost wept. The look of ecstasy on my wife’s face was almost unspeakably beautiful,” says Jory. To learn more about health-care provider education, click here. 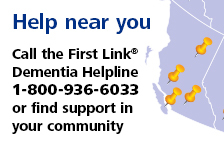 To connect with First Link® dementia support, click here.